Late August and ALL of September are really busy months for me in Maine. First of all, son Bryan often comes for his birthday, which is September 11th. Bryan and Corinne like to come visiting in the early fall as most of the tourists have gone home or are taking a breather before the fall foliage gets rolling. And, it’s cooler. Second, in Maine, September is the red month (tomatoes), not July, as is true for regions south of us. Plus, the gardens are cranking out food at alarming rates. So I am busy blanching, roasting, drying, lacto-fermenting, and generally reveling in all the bounty of our earth in Maine. Third, MOFGA, the Maine Organic Farmers and Growers Association fair happens in the third weekend of September. This fair, also known as the Common Ground Fair, is one of my most favorite things to attend all year. Fourth, Coastal Quilters starts its new year in September. I agreed to be President this year, so I’ve had a fair amount of organizing and reviewing to do to get back up to speed. We had a terrific organizational meeting September 14th, and we’ll have a really good year this year I think. Fifth, I start the process of putting the yard to bed for the winter. The flower pots are played out. The wind chimes have to be taken down. The hummers are gone. The porch furniture and kayaks have to be stored. The chickens have to be winterized. And, the garden put to bed with the new garlic planted for next year. I have LOVED having that garden fenced all this summer–especially since I never was able to keep the hens I have now inside their pen. So….I will do some separate entries on some of these events. But I will leave you with some fun pictures taken more or less in late August/early September. 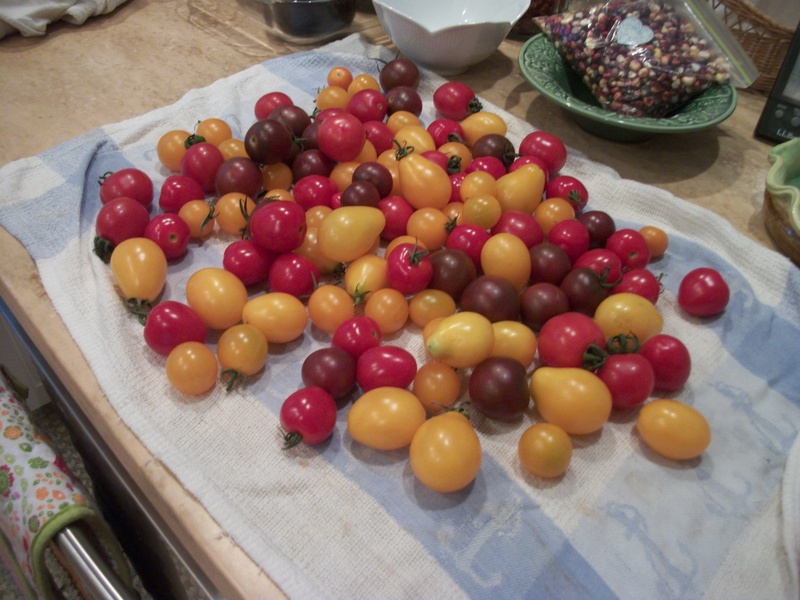 Susan McBride of Golden Brook Farm grew these awesome cherry tomatoes. I experimented with drying these to see which ones were the best. Hands down, the purple heritage cherry tomato was. They are like eating candy–and I know I will enjoy having them on hand all winter when the snow is flying. That bag of highly colored bits is corn from Margaret Rauenhorst and Ronald VanHeeswijk. I’m going to grind it and make cornbread with it any day now. I planted random squash seeds in the blue tubs this year. 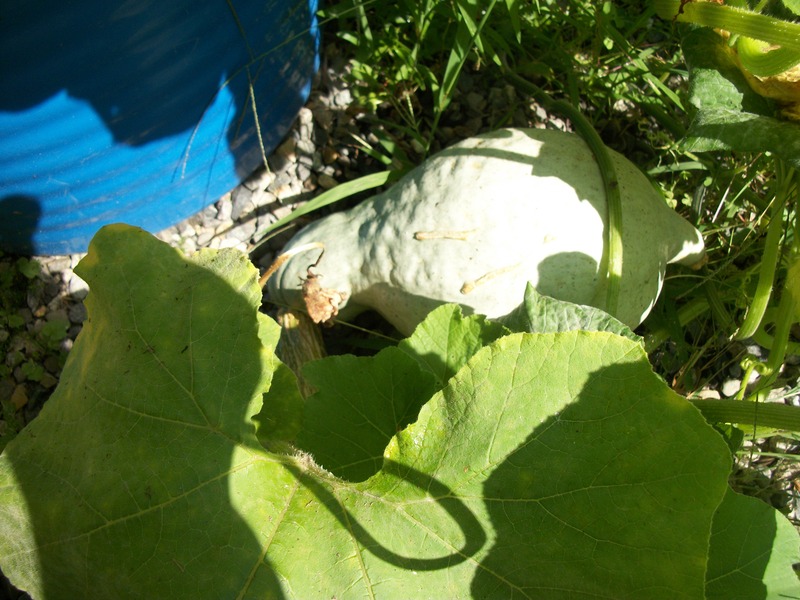 One is growing a Hubbard Squash–which delights me so much. I will go ahead and collect the squashes as soon as it stops raining and put them into the garage to “sugar off” for a bit. They do better when they have a bit of time to cure. The Blue Hubbard squash can get HUGE–and is a really great all-purpose squash. It’s delicious to eat and makes great “squash” pie too. 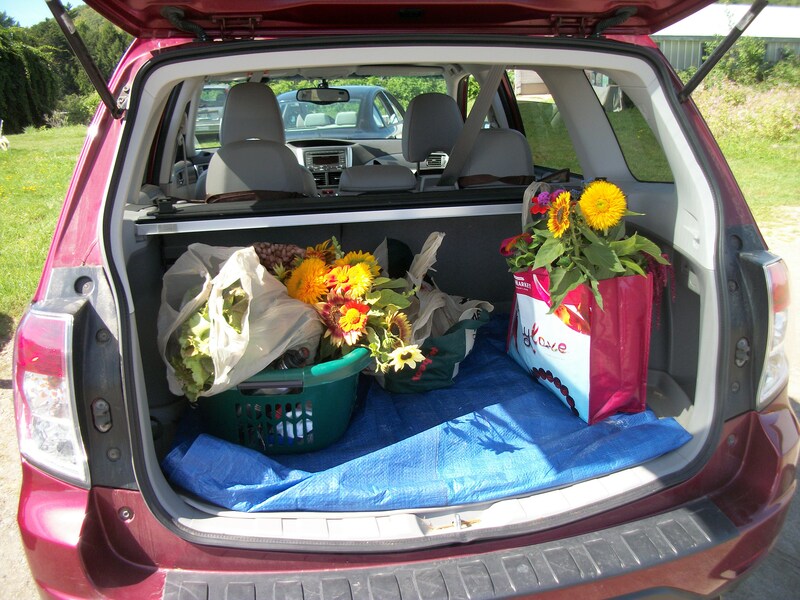 Here is a typical Hope’s Edge pick-up day–with Giovanna McCarthy. We have sacks of food and flowers! I’m trying to keep up with you! Don’t be disappointed if I don’t comment often because I’m really In awe of your blog. 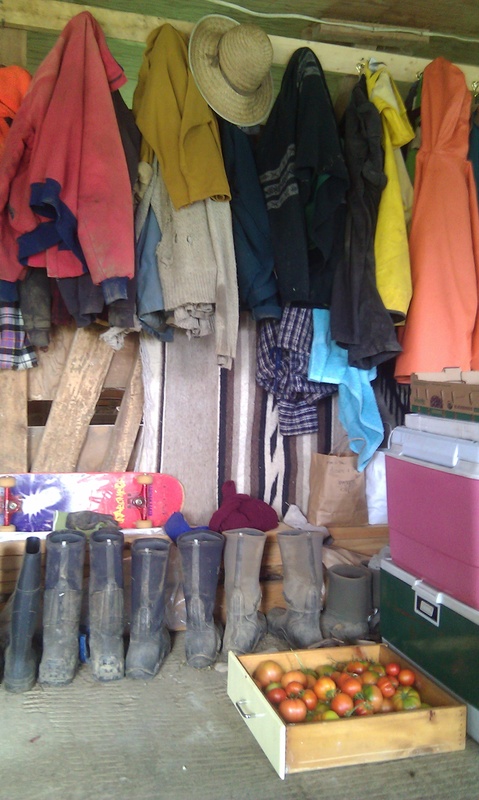 I really love John’s photo shot of hanging clothes–if you print it on cards I want one or will buy some.